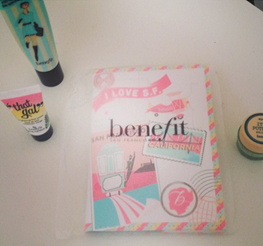 EJM Beauty: Pore O' Clock with Benefit Cosmetics Trio Products I Love.. You will do to! In short few hours it will be Pore O’ Clock on most busy ladies a like at their desks will, have that little moment of a mirror check for that touch-up to end your day on good note. My own beauty regime has even me clocking in on 4pm (aka Pore O’ Clock) on the dot with Benefits Porefessional, Its Potent! Eye Cream, and finally ‘’ That Gal’’ face primer. I normally on a morning before I head out the door find myself carrying out my own regime of cleansing, exfoliating, moisturizing etc. Following from that I will let my moisturizer take its time to sink into my skin ahead, of applying Benefits Porefessional onto my face or if I’m in rush I will mix the Porefessional balm with my foundation. I find that either way I apply the Porefessional balm wither its separate or mixed together it still acts a concealer of minimizing the appearance of pores. Benefits Its Potent! Eye Cream is my must have when it comes rescuing me from my late nights meaning that I can sneak into college or wherever I am meant to be fresh as a daisy with cuppa in hand. (My peers can often tell if I’ve not applied it that morning with the comments of late night? “You look tired”.) This little pot of joy will hide your dark circles in one application for as long as you need it for in the early hours of the morning. Finally to end this little Pore O’ Clock trio ‘’That Girl’’ Face Primer is my handbags best friend alongside that little bottle of mini L’EAU de Chloe because, this little wonder enables you to brighten up your complexion underneath makeup when you’re doing your make up routine or even that little touch up to your foundation at your desk. Either way I love these three products from Benefits Cosmetics due to the fact you can apply them when you’re wearing makeup, underneath your makeup, or even wear them when you have them casual days off from wearing makeup Ladies…. See more of Benefits Cosmetics products here! Are you clocking in for Pore O’ Clock today (4pm), if you are don’t forget to clock in with the hashtag #poreoclock on Twitter, Facebook, Instagram, or watch their tutorials on Youtube.